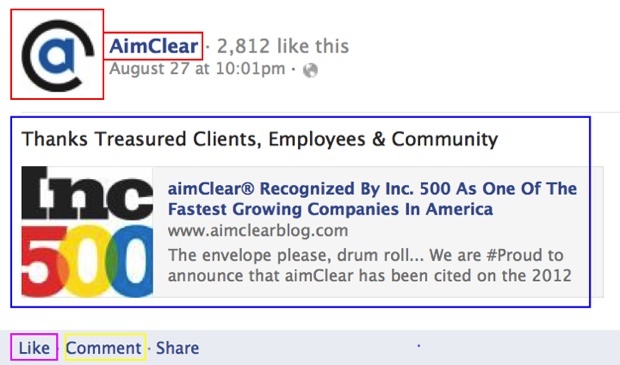 This is a guest post by Facebook marketing master Marty Weintraub, CEO of aimClear and author of Killer Facebook Ads. This Part 2 is a continuation of Part 1 that can be found on aimClear’s blog. 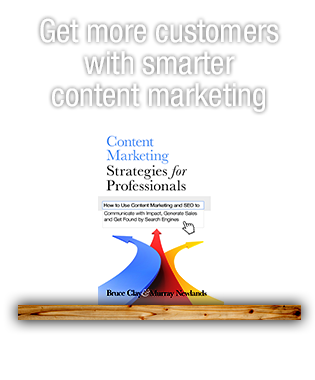 Bruce Clay, Inc. is honored that Marty and aimClear would bring this conversation to our blog. 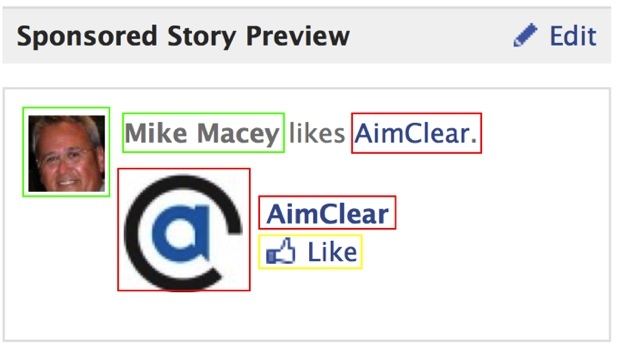 We’re looking forward to some audience cross-pollination and welcome aimClear fans to our community. Without taking time to study what posting initiative generates what units with which actions, marketers literally spray actions all over the place. Compounding this are Facebook ad units (Sponsored Stories) that create hybrid paid/organic units (paid/organic amplification). Confused? Understandably. There are a number of content types available to marketers on Facebook, each with their own presentations and available interactions. Read on and we’ll dig right in, starting with a description of simple Facebook units and heading into more complex mashup units. 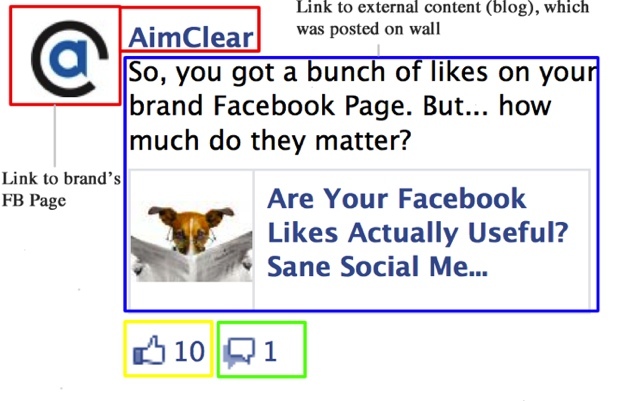 When you post something in Facebook, some users see a reciprocal content object on their FB page. Let’s call these content blocks “units.” There is a sweet array of organic and paid content units. Page posts of all types, Facebook ads, recommended friends, birthday notifications, and the ticker are all examples of units. Each unit, whether paid or organic, has defined characteristics and several variables, contingent on what users and brands post and how they interact. Paid units (Facebook ads) are contingent on what type of ad unit advertisers purchase. 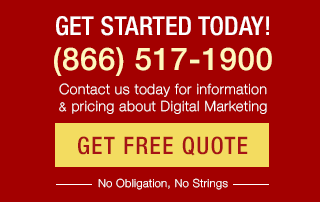 Even within similar paid and organic units, there can be a wide variety in presentations, I.E. some FB ads have “like” options and others don’t. Every unit is comprised of text and/or images, just like any web page. Some text and images link to a collection of “actions,” including destination URLs within Facebook and external. Actions can be anything from liking something, diving right into comments, interacting with an application, watching a video, and visiting an external URL. Fully understanding the types of organic posts and ads and their associated actions is fundamental to Facebook marketing. The easiest place to begin our exploration of how FB content units behave is to look at a very simple page post type, bookmarking a single external link on a FB brand page wall. Even this simple organic unit offers users interesting options that affect what marketers can accomplish. 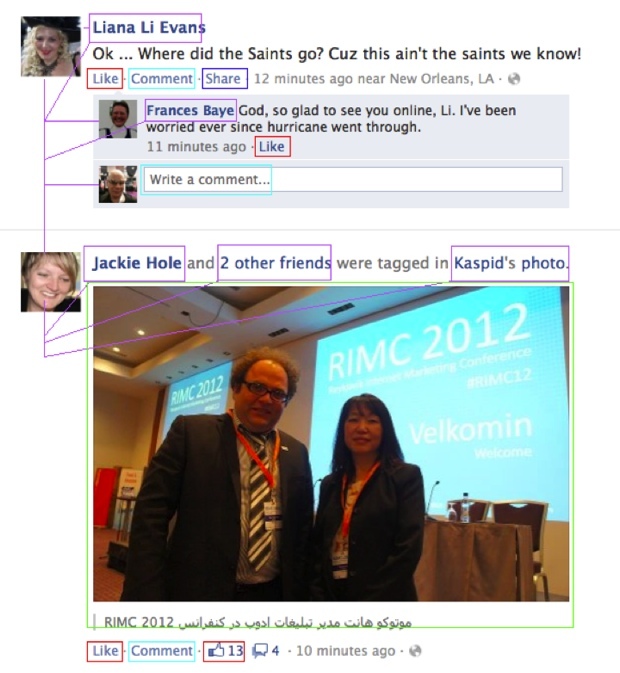 The brand’s logo and name in the upper left (outlined in red) are linked to the brand’s FB page. This action in itself may or may not be valuable, depending on what the user chooses to do once on the brand page. No matter what, branding occurs. The entire rectangle, outlined in blue, is hot to the external URL that was bookmarked on the brand wall in the first place. Arguably, this type of organic unit is the most valuable because it’s designed to drive users out of FB to content brands own. To understand how organic FB units yield actions, the best place to look is in Facebook Insights, the analytics bundled with the page admin role. Click on the “Engaged Users” metric for a breakout of how the page post performed. Insights analytics even show any negative feedback at the page post level. Clicking on the Insights “Talking About This” metric yields additional data on page post likes, comments, and shares— all actions marketers seek. While desirable, these actions don’t have quite the impact, IMHO, as the ability to drive users out of Facebook to content we own, or even as a page like (which is a more permanent subscription). Have a look at the organic units you’re posting on your brand’s page. Ask yourself what they are for. Do they drive users deeper inside of FB? Are they designed to take users outside of FB, to content you control? Or, do they scatter traffic in all directions, and is that spray beneficial? There are dozens of organic posting permutations in FB. Understand what they are and what the user might do. Sometimes the simplest are most effective because users only have options to do what we desire, like click on an outbound link. Facebook ads range from incredibly simple to extremely complex. The most simple does only one thing; send users to external websites. It’s a beautiful thing. This paid unit has been around since November of 2007, and does mighty fine work. It does not build page likes or drive users to the wall. 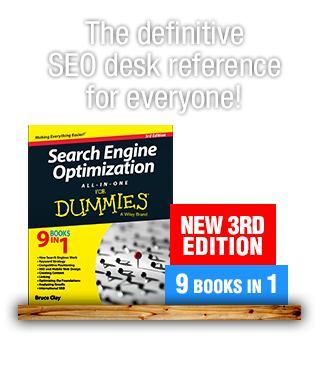 It drives traffic to external sites. Whereas this ad unit is created to take users external, the Sponsored Story example below is all about likes. There is no part of this ad unit that sends users outside of FB. 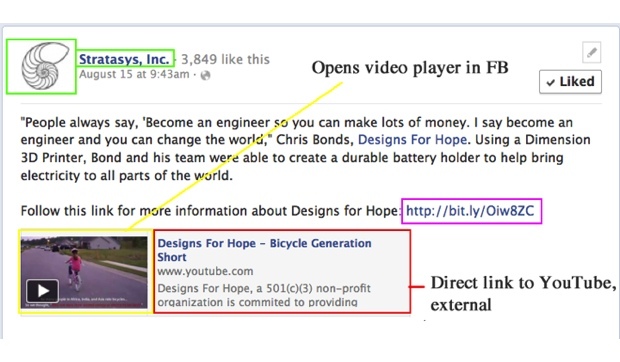 Sponsored Stories are paid FB ad units that offer users a couple of different options. 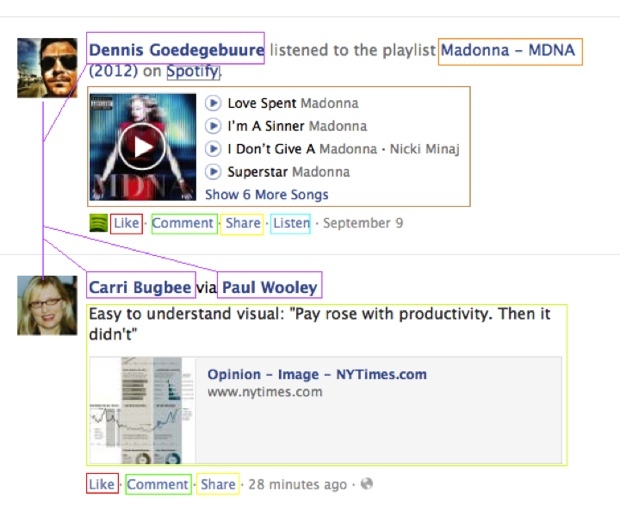 The green zone takes users to the profile of the person who FB exploits for the paid recommendation. The red box takes users to the brand’s page. This often results in a like. The yellow box offers users a chance to cut to the chase and like the brand inline. This Page Like Sponsored Story generates tons of page likes because it comes with the personal endorsement of the target’s friends who also like the brand. 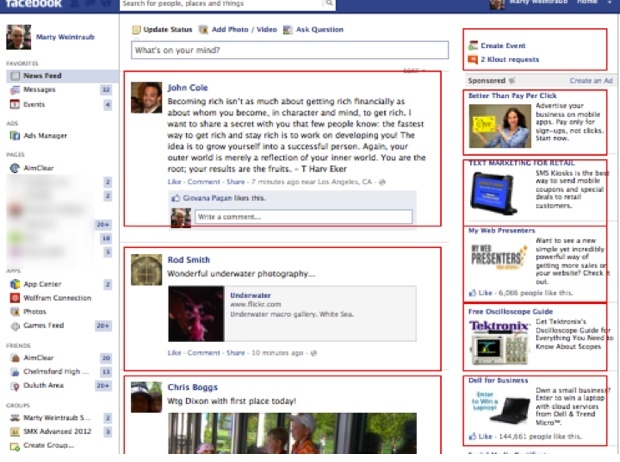 The FB ad unit below is called a Page Post Ad. We love it. In FB ads, marketers can choose to promote organic content that has been bookmarked on the brand’s wall. It’s a fascinating amplification ad unit that sends some traffic external and other users inside of FB, generating post likes and page likes. The red zone is a link to the brand’s page. The entire blue box drives traffic to whatever external URL was bookmarked in the original page post. There are inline links to like as well as a comment link. This unit is amazing for content promotion and yields amazing results when wielded properly. Take a few minutes to study the results here. The overall cost per action is about a $0.91. All of the actions are cool, some being more valuable than others. I always think that driving traffic outside of FB (link clicks), to content we control is the best use of FB. Have a look inside the FB ads platform at the actions by clicking on “See full actions report.” The group of actions that users took in response to this ad unit is very cool. Comments are good because the result is engaged users. Page post likes are useful as well because for seven days we can market by Sponsored Stories to friends of friends at the page post level. Go ahead and figure out the cost for each type of action against the total cost. Likes are more than $5.00, which is acceptable for highly targeted users to seed a community with focused members. Clicks to the external content cost about $1.30. Consider this: External clicks were purchased at very reasonable price and the 17 page likes were free. There is an overall cost per action with a proportional breakout of all that happened. 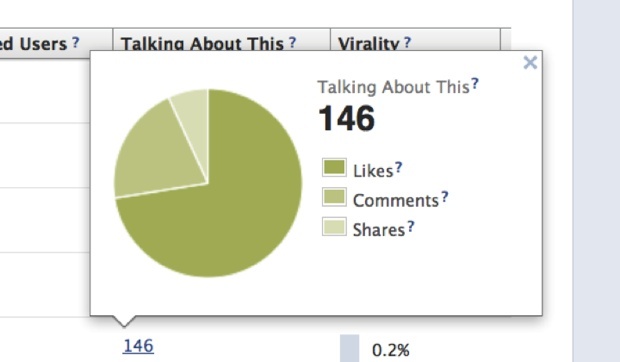 The full actions report for page post ads, to my mind, is the coolest report in all of FB. It makes some sense to look at the full report for this ad, which ran for about a day. There were 156,704 impressions targeted to about 1.4 million users. Over the course of a week, no matter what else occurred, some groovy branding will have taken place. At a $0.60 CPM, the result would be desirable for many even before the sub $1.00 actions. The point is that FB results are not black or white. There is a continuum of results ranging from outbound clicks to likes and comments. It’s safe to say that many marketers lose out on ROI because they’re not aware of how their paid and organic ads and posts present users with options that do not facilitate the KPI. Now that you’re tuned into this thinking, have a look at these excerpts from my Facebook feed. When you post on your personal page or brand’s wall, do you know what options users get? How do they support your objectives? 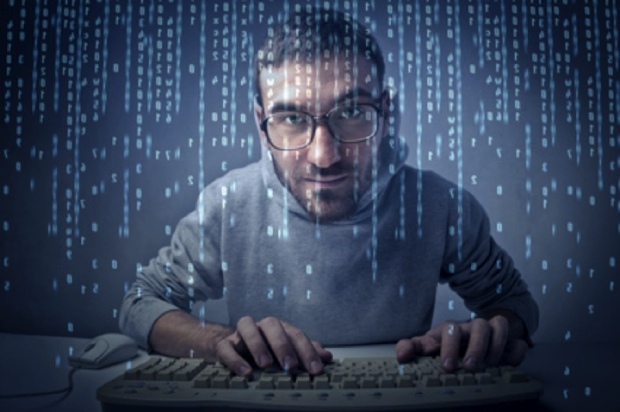 Stay tuned in and study the variables presented when you post or buy ads. Make sure you understand the range of actions that may be taken. If you want users to follow an external link, present them with as few options that drive traffic to FB-internal as possible. 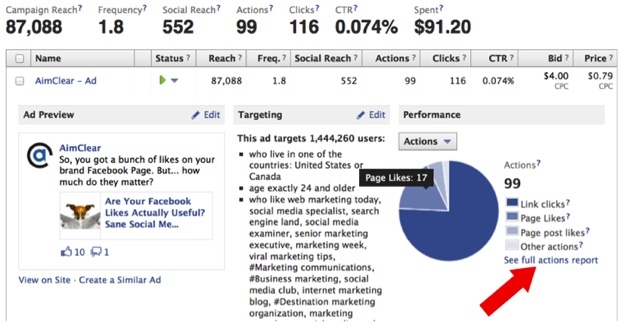 Don’t look at FB ROI as only cost per like or external click. Keep in mind the continuum of options you present users, and how the understanding can help your marketing efforts. This post is part of a series of articles studying central social media KPIs (key performance indicators) and tactics. The first installment, Are Your Facebook Likes Actually Useful? Sane Social Media Marketing, Part 1, details emergent methodology to study segmented psychographics of users who like a brand page on Facebook.